This section is new , do take the time to suggest improvements. 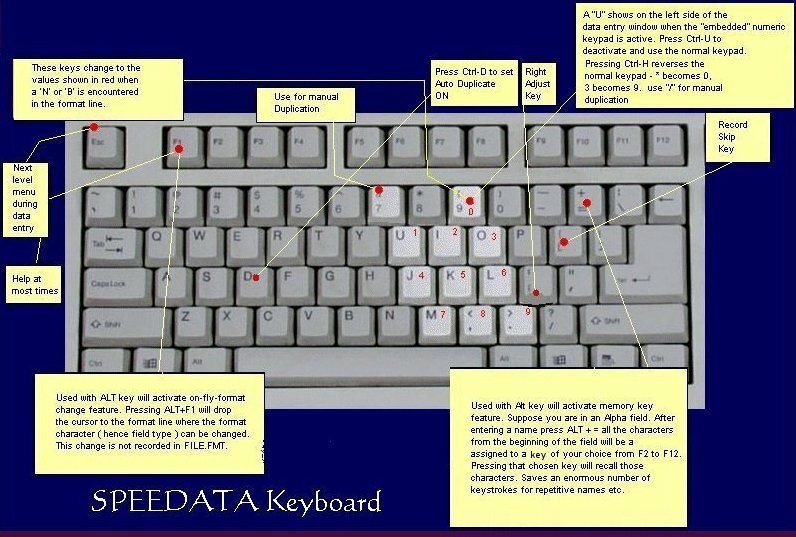 To quickly get a hands on feel of SPEEDATA, please follow this section step by step, preferably while sitting on the computer. Directory and drive are specified explicitly to simplify writing these instructions. ...And don't forget to look through FILE.FMT using EDIT or DR.COM (an old PC magazine utility which is great for viewing files without damaging them). Just highlight the file and press ENTER. Start MSDOS Mode or click on the MSDOS prompt (for the DOS Box) in WIN9x. Press Alt-Enter to get into full screen mode . Make C: the default drive. Make this the default directory.. IMPORTANT NOTE: The only restriction in the Freeware SPEEDATA is that it will work only from C:\SP , so bear with us. Extract all files from SPEEDATA.ZIP ( SPEDTA3*.zip if from SIMTEL ) to this directory . Now for trial purposes make another directory called SPTEST . The new directory will be C:\SPTEST. Copy FILE.FMT from the extracted files to this directory. Also copy SP.POS to this directory. This is the directory in which the data file will be created . This directory need not contain SP.EXE . Copy sp.pos also to this directory. Start SPEEDATA by typing in C:\SP\SP. ( You can also put c:\SP in the environment path so that you just have type SP ). This will ask for the data drive . Enter C here . This point will not accept a directory . You must change(make it the default ) to the directory in which the data file is to be created before starting SPEEDATA. Even at this point you can press F1 to get a screen which makes some general comments about SPEEDATA . This portion assumes that you have not skipped copying SP.POS to the default directory C:\SPTEST. This file provides the format name 'DRAFTS' the data file name 'DRAFTS' and the drive name . So you can merely press <enter> at the prompts. At the operator name prompt press <enter> . We know nobody who actually enters a name here . Now you should see the menu screen . You should select "ENTER " here. This should land you at the main data entry screen . Most of the stuff is self explanatory , it also has record per hour and Keystroke per hour stats . ( Press Alt-1 Alt-2 Alt-3 and see the format type change in the lower left hand corner ). For now just look at the format line the 1st format has many fields . The 'A' field will accept alpha numeric characters , the 'N' field will accept numeric only ( on pressing skip key ';' , the field is filled with 0's ). The 'B' field will also accept numeric characters , plus it will accept blanks too. The 'D' field automatically duplicates numeric characters from the previous record , when the auto duplicate switch is on . The auto duplicate switch is put on by pressing Ctrl-D. For now put auto duplication off and keep the 'I' key pressed . You will see that it fills 'I' in the alpha fields and 2's in the numeric fields. The 'Y' field is an auto increment field . Notice that after the 1st record is entered . A different format appears and this is shown as FORMAT #2 at the bottom right hand corner of the screen . This is because the format line has the word CIRCLE which causes the format to circle automatically . ( The other options at this point are CHAIN / MBF and blank ). Pressing Escape key here will bring you to a sub menu, where you can view ,update etc. Selecting Exit here will bring you to the main menu from where you can exit the program. Here's another one . Again for the sake of simplicity start in an alpha field . 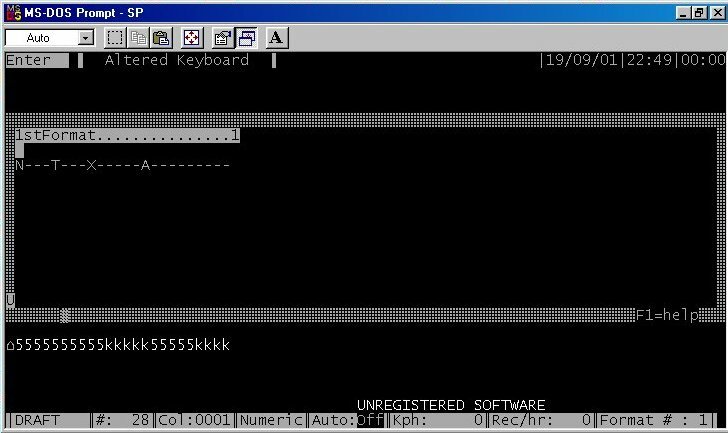 Type in a few characters then press Alt-F1 the cursor will drop to the format line . Here Key in 'N' for a numeric field . For the duration of the session only numeric will be accepted from that point to the beginning of the next field . This change is not recorded in FILE.FMT. Some points to note about SPEEDATA when first trying it out. There are a few rough edges but they are not in the main section of the program at which the data entry operator spends most of the time. When the program starts off it asks you which drive. Just enter the drive only where the data file will be created. Entering the wrong drive name or including a directory can create problems. When starting off first time just take care of to distinguish between the names of the format and the data file. If a mistake is made here you just have to press Cntl- C.
The right adjust key right adjusts when the field is specified as right adjust. Otherwise it just fills the remaing field with 0's or blanks. 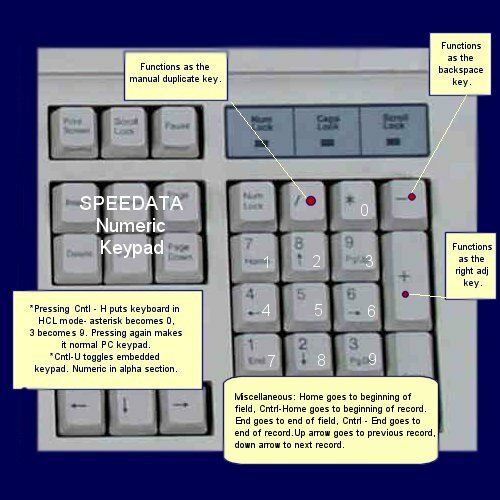 SPEEDATA does not provide any feature already in MS-DOS. »You have to use EDIT to create formats in FILE.FMT. »To copy a number of files to a single file use :Copy file1.fil + file2.fil both.fil . The program has been around since floppy disk days, so it does not accept directories. We may change that shortcoming sometime, though it does not seem to be necessary. Rest assured it works - has been working for years - at some places more than 8 hours per day. However there is no way to skip the adjustment period once you decide to use this. I almost forgot - it is free for individual use, at home. For others you can pay when you actually profit from it . It is $500 or equivalent per site. For corporate wide usage or other cases do contact. Paid for or not support is free via e-mail, it helps us make whatever improvements we can. You may find other pricing mentioned elsewhere please ignore those - we will be correcting that soon.